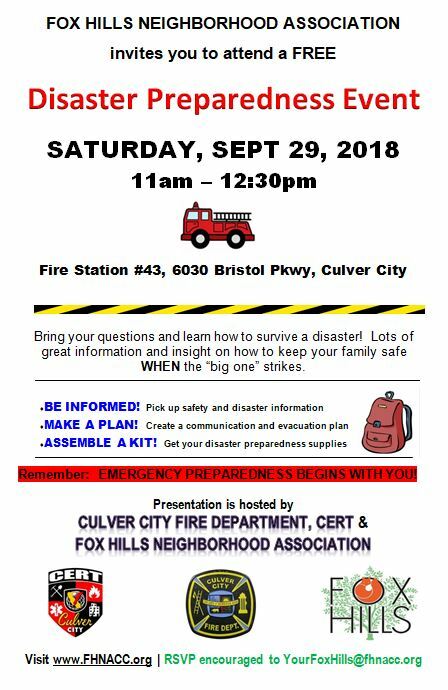 Mark your calendar for Saturday, September 29th, 11am – 12:30pm for the Fox Hills Neighborhood Association’s Disaster Preparedness Event at the Culver City Fire Station #43 on 6030 Bristol Parkway. We recommend walking to Fire Station #43. Otherwise there is metered parking on Uplander or free parking on Buckingham Parkway.